This page describes the cult of the goddess in the north-western Peloponnese and central Greece. Her most important sanctuary in the region was the Alean shrine in the Arkadian town of Tegea. Another important sanctuary was that of Alalkomenai in Boiotia which was her reputed birth place. "Within the precincts of [Artemis] Laphria [at Patrai, Akhaia] is a temple of Athena surnamed Panakhaia (of All Akhaia). The image is of ivory and gold." "In the marketplace [of Patrai, Akhaia] s a temple of Zeus Olympios; the god himself is on a throne with Athena standing by it." "On the market-place [of Patrai, Akhaia], in the open, is an image of Athena with the grave of Patreos in front of it." "The people of Patrai have other sanctuaries. These are not in the open, but there is an entrance to them through the porticoes. The image of Asklepios, save for the drapery, is of stone; Athena is made of ivory and gold." "The boundary between Akhaia and Elis is the river Larisos, and by the river is a temple of Athena Larisaia (of the Larisos)." "The people of Dyme [in Akhaia] have a temple of Athena with an extremely ancient image." "[In Triteia, Akhaia] there is also a temple of Athena, and the modern image is of stone. The ancient image, as the folk of Triteia say, was carried to Rome." "It is another fifteen stades from Panormos [in Akhaia] to what is known as the Fort of Athena." "At Aigion [in Akhaia] you find a temple of Athena . . . Of Athena there are two images of white marble." "In a building right in front of the entrance are images, of bronze like the others, representing Poseidon, Herakles, Zeus and Athena. They are called gods from Argos. The Argives say it is because they were made in Argos; the people of Aegion themselves say that the images were deposited by the Argives with them on trust. They say further that they were ordered to sacrifice each day to the images. But bethinking themselves of a trick they sacrificed a vast number of animals, but the victims they ate up at public feasts, so that they were not put to any expense. At last the Argives asked for the images to be returned, whereupon the people of Aegion asked for the cost of the sacrifices. As the Argives had not the means to pay, they left the images at Aegion." "By the sea at Aigion is a sanctuary of . . . Zeus Homagyrios (Assembler). Here are images of Zeus, of Aphrodite and of Athena." "The sights of Aigeira [in Akhaia] worth recording include a sanctuary of Zeus with a sitting image of Pentelic marble . . . In this sanctuary there also stands an image of Athena. The face, hands and feet are of ivory, the rest is of wood, with ornamentation of gilt work and of colors." "On the way to the city [of Pellene, Akhaia], close up to it, is a temple of Athena, built of local stone, but the image is of ivory and gold. They say that Pheidias made it before he made the images of Athena on the Athenian acropolis and at Plataia. The people of Pellene also say that a shrine of Athena sinks deep into the ground, that this shrine is under the pedestal of the image, and that the air from the shrine is damp, and consequently good for the ivory." "Before them [the statues of Demeter and Persephone at Megalopolis, Arkadia] he made small maids in tunics reaching to the ankles, each of whom carries on her head a basket full of flowers. They are said to be daughters of Damophon, but those inclining to a more religious interpretation hold that they are Athena and Artemis gathering the flowers with Persephone." "Within the enclosure of the goddesses [Demeter and Persephone in Megalopolis, Arkadia] are the following images, which all have a square shape : Hermes, surnamed Agetor, Apollon, Athena, Poseidon, Helios too, surnamed Soteiros (Saviour), and Herakles." "Behind the portico called after Philip of Makedon [in Megalopolis, Arkadia] are two hills, rising to no great height. Ruins of a sanctuary of Athena Polias (of the City) are on one." "A little lower down [the hill of the temple of Artemis in Megalopolis, Arkadia] there are [statues of] gods, also of square shape, surnamed Ergatai (Workers), Athena Ergane (Worker) and Apollon Aguieus (God of Streets), to Hermes, Herakles and Eileithyia." "[Outside the Gate of the Marsh at Megalopolis, Arkadia] there is also a sanctuary of Athena surnamed Makhanitis (Contriver), because the goddess is the inventor of plans and devices of all sorts." "Tegea [in Arkadia] still endures fairly well, and so does the temple of Athene Alee." "[The mythical king] Aleos built the old sanctuary in Tegea of Athena Alea, and made Tegea the capital of his kingdom." "Laodike, a descendant of Agapenor [i.e. leader of the Arkadians in the Trojan War who settled in Kypros], sent to Tegea a robe as a gift for Athena Alea. The inscription on the offering told as well the race of Laodike :--‘This is the robe of Laodike; she offered it to her Athena, sending it to her broad fatherland from divine Kypros.’"
"[In Tegea, Arkadia there is] the ancient sanctuary of Athena Alea [which] was made for the Tegeans by [the mythical king] Aleos. Later on the Tegeans set up for the goddess a large temple, worth seeing. The sanctuary was utterly destroyed by a fire which suddenly broke out when Diophantos was archon at Athens, in the second year of the ninety-sixth Olympiad, at which Eupolemos of Elis won the foot-race. The modern temple is far superior to all other temples in the Peloponnesos on many grounds, especially for its size. Its first row of pillars is Doric, and the next to it Korinthian; also, outside the temple, stand pillars of the Ionic order. I discovered that its architect was Skopas the Parian, who made images in many places of ancient Greece, and some besides in Ionia and Karia. On the front gable is the hunting of the Kalydonian boar . . . On the gable at the back is a representation of Telephos fighting Akhilleus on the plain of the Kaikos. The ancient image of Athena Alea, and with it the tusks of the Kalydonian boar, were carried away by the Roman emperor Augustus after his defeat of Antonios [i.e. Marc Antony] and his allies, among whom were all the Arkadians except the Mantineans . . . The emperor Augustus only followed a custom in vogue among the Greeks and barbarians from of old. The image of Athena Alea at Rome is as you enter the Forum made by Augustus. Here then it has been set up, made throughout of ivory, the work of Endoios. Those in charge of the curiosities say that one of the boar's tusks has broken off; the remaining one is kept in the gardens of the emperor, in a sanctuary of Dionysos, and is about half a fathom long. The present image at Tegea was brought from the parish of Manthurenses, and among them it had the surname of Hippia (Horse Goddess). According to their account, when the battle of the gods and giants took place the goddess drove the chariot and horses against Enkelados. Yet this goddess too has come to receive the name of Alea among the Greeks generally and the Peloponnesians themselves. On one side of the image of Athena stands Asklepios, on the other Hygeia (Health), works of Skopas of Paros in Pentelic marble. Of the votive offerings in the temple these are the most notable. There is the hide of the Kalydonian boar, rotted by age and by now altogether without bristles. Hanging up are the fetters, except such as have been destroyed by rust, worn by the [historic] Lakedaimonian prisoners when they dug the plain of Tegea. There have been dedicated a sacred couch of Athena, a portrait painting of [the mythical princess] Auge, and the shield of Marpessa, surnamed Khoira, a woman of Tegea . . . The priest of Athena is a boy; I do not know how long his priesthood lasts, but it must be before, and not after, puberty. The altar for the goddess was made, they say, by [the mythical hero] Melampos, the son of Amythaon. Represented on the altar are Rhea and the nymph Oinoe holding the baby Zeus. On either side are four figures: on one, Glauke, Neda, Theisoa and Anthrakia; on the other Ide, Hagno, Alkinoe and Phrixa. There are also images of the Mousai and of Mnemosyne (Memory). Not far from the temple is a stadium formed by a mound of earth, where they celebrate games, one festival called Aleaia after Athena, the other Halotia (Capture Festival) because they captured the greater part of the Lakedaimonians alive in the [historical] battle." "There is at Tegea another sanctuary of Athena, namely of Athena Poliatis (Keeper of the City) into which a priest enters once in each year. This sanctuary they name Eryma (Defence ) saying that [the mythical king] Kepheos, the son of Aleos, received from Athena a boon, that Tegea should never be captured while time shall endure, adding that the goddess cut off some of the hair of Medousa and gave it to him as a guard to the city [i.e. when Herakles led the Arkadians in an attack on Sparta]." "Khryseis went to Tegea [in Arkadia] and supplicated Athena Alea." "[The historical Spartan general Pausanias] did not wait to stand his trial, but was received by the people of Tegea as a suppliant of Athena Alea. Now this sanctuary had been respected from early days by all the Peloponnesians, and afforded peculiar safety to its suppliants, as the Lakedaemonians showed in the case of Pausanias and of Leotykhides before him, and the Argives in the case of Khryseis; they never wanted even to ask for these refugees, who were sitting as suppliants in the sanctuary, to be given up." "[The Spartan Leotykhides] being brought to trial in Lakedaimon he voluntarily went into exile to Tegea, where he sought sanctuary as a suppliant of Athena Alea." "[For the temple of Hera in Mantineia, Arkadia] Praxiteles made the images Hera is sitting, while Athena and Hera's daughter Hebe are standing by her side." "They [the people of Mantineia, Arkadia] also worship Athena Alea, of whom they have a sanctuary and an image." "The acropolis [of Pheneos, Arkadia] is precipitous on all sides, mostly so naturally, but a few parts have been artificially strengthened, to make it more secure. On the acropolis here is a temple of Athena surnamed Tritonia, but of it I found ruins only remaining." "There is also built upon a mountain-top, thirty stades away from the city [of Kleitor, Arkadia], a temple of Athena Koria (the Maiden) with an image of the goddess." "The sanctuaries of the gods here [at Alea, Arkadia] are those of Artemis Ephesia and Athena Alea." "There are sanctuaries here [in the town of Aliphera, Arkadia] of Asklepios and Athena; the latter they worship more than any other god, saying that she was born and bred among them. They also set up an altar of Zeus Lekheates (In child-bed), because here he gave birth to Athena. There is a stream they call Tritonis, adopting the story about the river Triton. The image of Athena is made of bronze, the work of Hypatodoros, worth seeing for its size and workmanship. They keep a general festival in honor of some god or other; I think in honor of Athena. At this festival they sacrifice first to Myagron (Fly or Mouse-catcher), praying to the hero over the victims and calling upon Myagron (the Fly or Mouse-catcher). When they have done this the flies [or mice] trouble them no longer." "Adjoining the land of Theisoa is a village called Teuthis [in Arkadia], which in old days was a town. In the Trojan war the inhabitants supplied a general of their own. His name according to some was Teuthis, according to others Ornytos. When the Greeks failed to secure favorable winds to take them from Aulis, but were shut in for a long time by a violent gale, Teuthis quarrelled with Agamemnon and was about to lead the Arkadians under his command back home again. Whereupon, they say, Athena in the guise of Melas, the son of Ops, tried to turn Teuthis aside from his journey home. But Teuthis, his wrath swelling within him, struck with his spear the thigh of the goddess, and actually did lead his army back from Aulis. On his return to his native land the goddess appeared to him in a vision with a wound in her thigh. After this a wasting disease fell on Teuthis, and its people, alone of the Arkadians, suffered from famine. Later, oracles were delivered to them from Dodona, telling them what to do to appease the goddess, and in particular they had an image of Athena made with a wound in the thigh. This image I have myself seen, with its thigh swathed in a purple bandage." "There are still left ruins of Mainalos [in Arkadia] itself: traces of a temple of Athena." "[In the sanctuary of Despoine, near Akakesion, Arkadia :] There are also wooden images of Apollon and of Athena. Of Athena a sanctuary also has been made." "On the straight road from Haimoniai [in Arkadia] is a place . . . called Athenaion (place of Athena). On the left of it is a temple of Athena with a stone image in it." "From Asea [in Arkadia] is an ascent up Mount Boreios, and on the top of the mountain are traces of a sanctuary. It is said that the sanctuary was built in honor of Athena Soteira (Saviour) and Poseidon by Odysseus after his return from Troy." "On the right of the gate [of Thebes, Boiotia] is a hill sacred to Apollon. Both the hill and the god are called Ismenion . . . First at the entrance are [statues of] Athena and Hermes, stone figures and named Pronai (Of the fore-temple). The Hermes is said to have been made by Pheidias, the Athena by Skopas." "[The historic] Thrasyboulos, son of Lykos, and the Athenians who with him put down the tyranny of the Thirty, set out from Thebes when they returned to Athens, and therefore they dedicated in the sanctuary of Herakles [at Thebes, Boiotia] colossal figures of Athena and Herkcles, carved by Alkamenes in relief out of Pentelic marble." "[The mythical founder of Thebes] Kadmos and the host with him were to make their dwelling [found Thebes] where the cow was going to sink down in weariness. So this is one of the places that they [the Thebans] point out. Here there is in the open an altar and an image of Athena, said to have been dedicated by Kadmos. Those who think that the Kadmos who came to the Theban land was an Aigyptian (Egyptian), and not a Phoinikian (Phoenician), have their opinion contradicted by the name of this Athena, because she is called by the Phoinikian name of Onga, and not by the Aigyptian name of Sais." "[In Thebes, Boiotia] are two stone images of Athena, surnamed Zosteria (Girder), said to have been dedicated by [the mythical step-father of Herakles] Amphitryon. For here, they say, he put on his armour when he was about to give battle to Khalkodon and the Euboians. It seems that the ancients used the verb ‘to gird oneself’ in the sense of ‘to put on one's armour.’"
"When Alexandros the son of Philippos led his forces against Thebes the gods sent them signs and portents presaging their imminent fate . . . In the city . . . the statue of Athena known as Alalkomeneis caught fire spontaneously, though no light was set to it." "The Plataians [of Plataia, Boiotia] have also a sanctuary of Athena surnamed Areia (Warlike); it was built from the spoils given them by the Athenians as their share from the battle of Marathon. It is a wooden image gilded, but the face, hands and feet are of Pentelic marble. In size it is but little smaller than the bronze Athena on the Akropolis, the one which the Athenians also erected as first-fruits of the battle at Marathon; the Plataeans too had Pheidias for the maker of their image of Athena. In the temple are paintings: one of them, by Polygnotos, represents Odysseus after he has killed the wooers; the other, painted by Onasias, is the former expedition of the Argives, under Adrastos, against Thebes. These paintings are on the walls of the fore-temple, while at the feet of the image is a portrait of [the historic] Arimnestos, who commanded the Plataians at the battle against [the Persians under] Mardonios, and yet before that at Marathon." 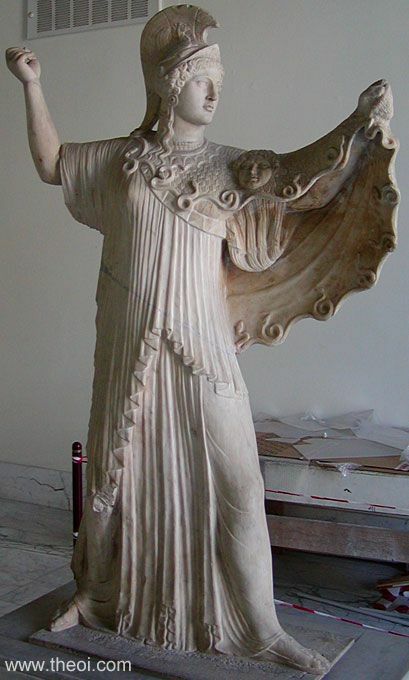 "In Teumessos [in Boiotia] there is also a sanctuary of Athena Telkhinia, which contains no image. As to her surname, we may hazard the conjecture that a division of the Telkhinians who once dwelt in Kypros came to Boiotia and established a sanctuary of Athena Telkhinia (of Telkhinia)." "[In Thespia, Boiotia there is an image of] Athena Ergane (Worker), as well as Ploutos (Wealth), who stands beside her." "Now as for Alalkomenai, the poet [Homer] mentions it, but not in the Catalogue : ‘Hera Argeia (of Argos) and Athena Alalkomeneis.’ It has an ancient temple of Athena which is held in great honor; and they say, at least, that the goddess was born there, just as Hera was born in Argos, and that it was because of this that the poet named them both in this way, as natives of these places. And it was because of this, perhaps, that he did not mention in the Catalogue the men of Alalkomenai, since, being sacred, they were excused from the expedition. And in fact the city always continued unravaged, although it was neither large nor situated in a secure position, but in a plain. But all peoples, since they revered the goddess, held aloof from any violence towards the inhabitants, so that when the Thebans, at the time of the expedition of the Epigonoi, left their city, they are said to have fled for refuge to Alalkomenai, and to Tilphossios, the mountain [sacred to Apollon]." "Alalkomenai [in Boiotia] is a small village, and it lies at the very foot of a mountain of no great height. Its name, some say, is derived from Alalkomeneos, an aboriginal, by whom Athena was brought up; others declare that Alalkomenia was one of the daughters of Ogygos. At some distance from the village on the level ground has been made a temple of Athena with an ancient image of ivory. [The Roman General] Sulla's treatment of the Athenians was savage and foreign to the Roman character . . . in Alalkomenai he added yet another to his crimes by stealing the image of Athena itself. After these mad outrages against the Greek cities and the gods of the Greeks he was attacked by the most foul of diseases. He broke out into lice, and what was formerly accounted his good fortune came to such an end. The sanctuary at Alalkomenai, deprived of the goddess, was hereafter neglected. In my time yet another incident added to the ruin of the temple. A large and strong ivy-tree grew over it, loosening the stones from their joints and tearing them apart. Here too there flows a river, a small torrent. They call it Triton, because the story is that beside a river Triton Athena was reared, the implication being that the Triton was this and not the river in Libya, which flows into the Libyan sea out of lake Tritonis." "When the Athenians took control of Khalkis [in Euboia, 506 B.C.] they divided the land into parcels for two thousand settlers; this was the area known as Hippobotos. They consecrated shrines to Athena in the place called Lelanton, and they leased out the rest of the land, according to the pillars which stand by the Stoa Basileios and carry a record of the leases."